Next November the 9th at the circuit Piero Taruffi of Vallelunga, the prize test on the Ferrari F10 for the 2 drivers that gave spectacle this year in the Formula 3 season battling until the last race. 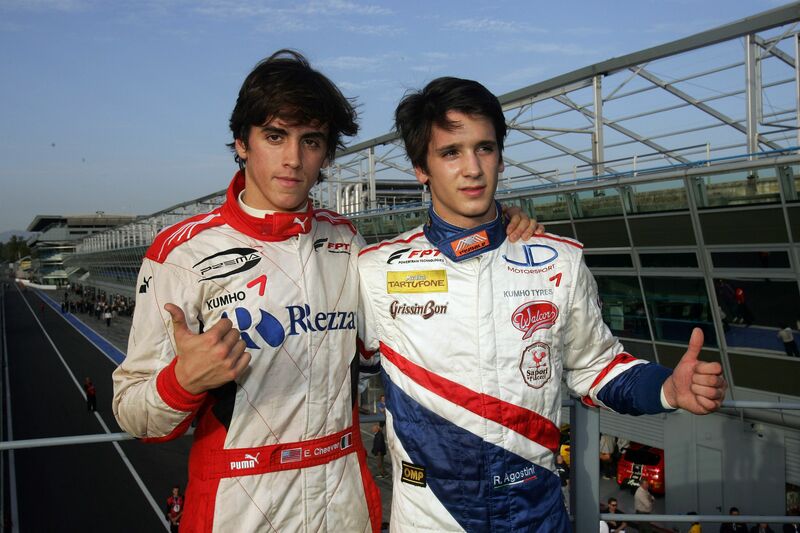 The winner of the F3 Euro Series, Daniel Juncadella, will also join them. 31/10/2012 - For Riccardo Agostini and Eddie Cheever a dream will come true next November 9th, as they will get into the cockpit of a Ferrari Formula 1 car for a whole testing day. The collaboration between ACI-CSAI and Ferrari Driver Academy, allows also in this year the two best drivers of the Italian series to test and show their potential at the wheel of a Formula 1 car. The Ferrari F10 will be the protagonist of the day next 9 November, that is the one that went close to the title with Fernando Alonso, pipped by the young Sebastian Vettel on the last race of the year on the Red Bull at Abu Dhabi. That Formula 1 season was one of the tightest with the German winning over the Asturian for just four points. Similarly, season 2012 of the Italian Formula 3 has been one of the tighest with 3 drivers fighting for the title until the last race, namely Riccardo Agostini, Eddie Cheever and Brandon Maisano. Six other drivers got at least one victory and 11 drivers got at least once on the podium, which shows a competitiveness that very few championships can witness. Together with the young drivers on top of the Italian Formula 3 Daniel Juncadella will also be on track next 9 November in Vallelunga as the twenty-one years old from Barcelona topped the charts of the Formula 3 Euro Series and of the first edition of the FIA European Formula 3 Championship. The Catalan in force at Prema Powerteam managed to get the title at the last race proceeding his team mate Raffaele Marciello, that is a pupil of the Ferrari Driver Academy and that grew up in the ACI-CSAI championships. Agostini and Cheever are currently involved in the GP2 tests at the circuit of Motmelò, Barcelona, in these days both with Scuderia Coloni where they exchanged the seat in the 2 testing days. Kevin Giovesi and Sergey Sirotkin have also taken part in the tests the first with Lazarus and the second with Dams. Riccardo Agostini - Padova (20/04/1994) - The eighteen years old from Padova obtained the victory in the rookies classification at his first season in Formula 3. The win came one race earlier than the end on the circuit of Vallelunga in mid September. Agostini obtained 5 wins, 4 second places,6 third and 8 fastest lap of the race in this season. Before getting to Formula 3, Agostini competed in Formula Abarth for two seasons. In 2010 the driver from Padova obtained the eleventh place with a win and two podiums on his scoreboard. Last year he competed in Formula ACI-CSAI Abarth obtaining the finals seventh place while in the European Series he finished eighth. Thinking about the Ferrari test he declared: "I am happy on running such an important test and I am preparing this event in the best possible way to get the most out of this occasion not only as a fantastic prize but also to shine on a car that is the dream of every driver". Eddie Cheever Jr. - Rome (05/06/1993) - Next 9 November he will put his name on the history of the Pranching Horse running a test some 35 years after his dad, who also nineteen years old back in 1977 tested the car that in the end went to the unforgettable Gilles Villeneuve. Eddie Cheever Jr., run his second season in Formula 3. He started his career on single seaters in 2009 with Formula Renault, moving then in 2010 to the Formula ACI-CSAI Abarth, ended with the 10th place, right ahead of Agostini. In 2011 he obtained 3 podiums, 3 third places, 8 pole positions and 5 fastest lap of the race. Ahead of this important event he declared: "This is a dream come true, and I hope that everything will go in the best possible way. Being on a Ferrari 35 years after my dad is an unforgettable emotion, let's hope to go as fast as he did back then".